Designed to fit over the Resort 7pc Dining Table Set, this furniture cover was created to keep your furniture covered for storage over the winter months, to keep them protected from a storm, or to place over your furniture when not in use to prevent fading. All outdoor furniture sets are subject to UV rays and weather elements, but these will keep your furniture dry, vibrant, and as long-lasting as possible to provide you with years of use. Designed to fit the Resort 7pc Dining Table Set. Heavy duty, weather resistant and water repellent fabric keeps your investment protected and looking new in harsh outdoor climates. Covers are constructed from high quality durable materials that are abrasion and UV resistant, and look great for years. Fabric is treated for anti-bacteria, anti-mold, anti-mildew resistance, chemical resistance and UV protection. 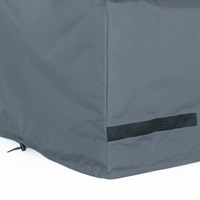 Breathable mesh vented panels allow air to circulate and keeps covers securely in place. 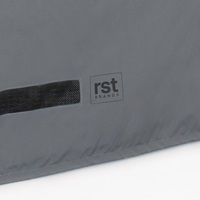 RST Brands logo badge on front edge indicates quality and showcases your product brand. All covers are designed by RST Brands and guaranteed to fit our furniture sets. Outdoor covers are sewn with high-quality polyester fabric and coated in polyurethane to withstand the elements of all seasons. 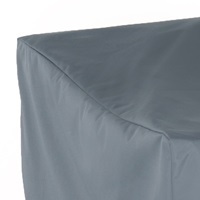 Outdoor covers include air vents to prevent against mold and mildew growth on your furniture. Buckle or zipper closures keep covers snug and right where they belong.